Dr. Hsu is fellowship trained in orthopedic trauma and foot and ankle surgery. Dr. Hsu treats a wide range of surgical and nonsurgical injuries. He treats acute as well as chronic conditions including fractures, ligament injuries, cartilage injuries, achilles and other tendon injuries, ankle arthritis, foot arthritis, ankle/hindfoot/midfoot/forefoot deformity, posttraumatic deformity/arthritis, flatfeet (planovalgus), high arched (cavovarus) feet, bunions and other toe deformities. He completed his undergraduate studies at the University of Pennsylvania in Philadelphia and obtained his MD from Cornell University in New York City. Additionally, he completed his orthopedic residency at Brown University, his Orthopedic Trauma Fellowship at Brown University, and his Orthopedic Foot and Ankle Fellowship at the University of Utah. Dr. Hsu’s professional affiliations include: American Academy of Orthopaedic Surgery; American Orthopaedic Association; American Orthopaedic Foot and Ankle Society; Orthopaedic Trauma Association; and Assistant Professor of Orthopedics at Brown University. 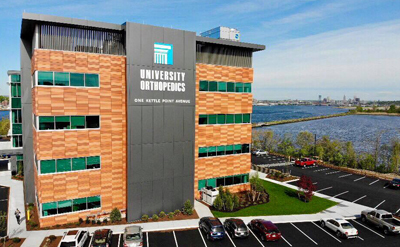 Dr. Hsu resides in Providence, RI and sees patients at University Orthopedics’ Providence, East Providence and East Greenwich, RI locations. Hsu RY, Lareau CR, Born CT, “Novel Posterior Splinting Technique to Avoid Heel Ulcers,” Orthopedics. 2013 Jan;36(1):31-2. Hsu RY, Bariteau J, “Management of Ankle Fractures,” Rhode Island Medical Journal. 2013 May 1;96(5):23-7. Hsu RY, Lareau CR, Kim JS, Koruprolu S, Born CT, Schiller JS, “The Effect of C-Arm Position on Radiation Exposure During Fixation of Pediatric Supracondylar Fractures of the Humerus,” The Journal of Bone and Joint Surgery. 2014 Aug 6;96(15):e129. Hsu RY, VanValkenburg S, Tanriover A, DiGiovanni CW, “Surgical Techniques of Gastrocnemius Lengthening,” Foot and Ankle Clinics, 2014 Dec;19(4):745-765. Eberson CP, Hsu RY, Borenstein T, “Procedural Sedation in the Emergency Department,” The Journal of the American Academy of Orthopaedic Surgeons, 2015 Apr;23(4):233-242. Bariteau JT, Hsu RY, Mor V, Lee Y, DiGiovanni CW, Hayda R, “Operative Versus Non-operative Treatment of Geriatric Ankle Fractures: A Medicare Part A Claims Database Analysis,” Foot and Ankle International, 2015 Jun;36(6):648-55. Kadakia RJ, Hsu RY, Hayda R, Lee Y, Bariteau JT, “Evaluation of One-Year Mortality after Geriatric Ankle Fractures in Patients Admitted to Nursing Homes,” Injury, 2015 Oct;46(10):2010-5. DePasse JM, Fantry AJ, Hsu RY, “Subtle Anterior Subtalar Dislocation: A Case Report,” The American Journal of Emergency Medicine, 2015 Oct;33(10):1538.e5-7. Hsu RY, Lee Y, Hayda R, DiGiovanni CW, Mor V, Bariteau JT, “Morbidity and Mortality Associated with Geriatric Ankle Fractures: A Medicare Part A Claims Database Analysis,” The Journal of Bone and Joint Surgery, 2015 Nov 4;97(21):1748-55. Gil JA, DeFroda SF, Hsu RY, “Modified sugar tong splint to avoid skin breakdown at the posterior elbow,” The American Journal of Emergency Medicine, 2016 Feb;34(2):332-5. VanValkenburg S, Hsu RY, Palmer DS, Blankenhorn B, Den Hartog BD, DiGiovanni CW, “Neurologic Deficit Associated with Lateralizing Calcaneal Osteotomy for Surgical Correction of Cavovarus Foot Deformity,” Foot and Ankle International, 2016 Oct;37(10):1106-1112. Alrashidi Y, Galhoum AE, Wiewiorski M, Herrera-Pérez M, Hsu RY, Barg A, Valderrabano V, “How to Diagnose and Treat Infection in Total Ankle Arthroplasty,” Foot and Ankle Clinics, 2017 Jun;22(2):405-423. Hsu RY, Barg A, Nickisch F, “Lesser Metatarsophalangeal Joint Instability: Advancements in Plantar Plate Reconstruction,” Foot and Ankle Clinics, 2018 Mar;23(1):127-143. Hayda R, Hsu RY, DePasse JM, Gil JA, “Orthopaedic Surgeon Radiation Exposure and Health Risks,” The Journal of the American Academy of Orthopaedic Surgeons, 2018 April;26(8):261-267. Dr. Hsu was very knowledgeable about my injury and I felt very comfortable discussing with him my treatment options for the bestoutcome. He also seems to be a caring person and was very kind. I felt I was in good hands with him as my doctor. Dr. Hsu is an excellent physician. He is professional, knowledgeable and an excellent surgeon. He answers all concerns and reassured me about my surgery. I would and have recommended Dr. Hsu to others. Lucy would like a second opinion in terms of treatment. I think Dr Hsu is spot on but she is suffering and looking for more info. Can he order an mri before the next appointment and can we possible meet with another sesamoid specialist ﴾foot﴿ just this one time? explained and making sure you understood. Dr. Hsu was terrific, very professional. The office does him a disservice in managing his time and clients....a 40+ minute wait is ridiculous and I came a half hour earlier for diagnostic which ran timely so the extra wait was unnecessary. Dr. Hsu is an excellent doctor who basically gave me back the ability to walk without pain. I will always be appreciative and will recommend him to anyone who needs a specialist in ankles. organization. Everyone involved was outstanding! This is my second visit to Dr. Hsu. He is friendly and polite; Ready to listen to my concerns and to offer non surgical suggestions first to improve my condition. I like that. asked Why questions or posed alternate solutions he patiently explained pros and cons. Was very happy with Dr. Hsu, would not hesitate to recommend him to anyone. Dr. Hsu always spends as much time as necessary to make sure you are fully comfortable with what he has to say. He is very thorough in his approach. DR. HSU WAS VERY KNOWLEDGEABLE AND PROFESSIONAL CONCERNING THE SECOND OPINION I WAS SEEKING CONCERNING MY FOOT ISSUES. Was very pleasant and communicated with the 15 year old patient with ease. I was very pleased with Dr. Hsu. He was very kind, professional and knowledgeable. He’s great. I’ve seen him a couple times and really enjoyed having him as a doctor. Dr. Hsu was extremely caring and professional. Explaining all options. I never felt rushed / he was willing to spend the time fir me to thoughtly understand my options and recovery time. Dr. Hsu was very thorough with his exam as well as going over how the injury itself actually happened. He has a great bedside manner, is patient and was very informative. I would highly recommended him to others. Thank you. Dr. Hsu was amazing! From the moment I met him he was extremely friendly and welcoming given the circumstances of my injury. He explained everything and had me feeling much better about everything thats to come. Dr. Hsu was very friendly, personable, and knowledgeable. He took into consideration my lifestyle and concerns when determining the best treatment plan. My visit was a very positive experience. recommended him to 2 people and I met with him 2 days ago! Your EP facility is also beautiful!